Do you have a spare $10,000 to over $120,000 to waste this year? If you’re still using sight glass, time control, or volume acquisition for the CIP process at your dairy, you’re losing money. Product waste is a reality in any dairy, but with the continually shrinking profit margins you face year-after-year, the need to reduce product waste is also a reality. If you’re using sight, time control or volume acquisition for your CIP process, you’re losing money in each of these four areas. Overall, your processing costs are going to be higher with these older methods. To put this into perspective, an ice cream maker replaced a time-based system with turbidity sensors. Once the ITM-3 was fully integrated and running, the plant witnessed a thirty second difference between the old timer based method and the new turbidity based method when they reviewed changeovers recorded on their PLC system. Before they implemented the ITM-3 in their production process, correction batches were commonly done to deal with diluted production batches that brought their final mix out of spec (6 hours per week). Today, they have tighter control of their process with the ITM-3A and don’t have to do adjustment batches to correct for flush water getting into finished product and diluting their final mix. During Clean in Place (CIP) the ITM‐3 is also used for pre-rinse to confirm that their piping system has been flushed clean. Prior to its use, this was done manually until an operator saw clear water; or by using a timer that was based on a piping configuration and flow rate that has more than likely changed. In addition to reducing their water usage by 19,500 to 39,000 gallons every year (at single flush point), they reduced their total loss per flush/changeover (fresh water, lost product, wastewater charges) by $639 per day. Their net actual annual cost savings after payback of the system was $16,281.80. “We had no idea that our old timer based method was wasting an average of $63.93 per day in profit or $16,621.80 annually after payback. “ -- Southeastern US Ice Cream Manufacturer All devices that come into contact with milk based product must be thoroughly cleaned on a regular basis to eliminate bacterial contamination. CIP systems (Cleaning-In-Place) components that come into contact with the media, such as tanks and piping, must be cleaned without dismantling the system parts. This provides a viable level of availability for the production process. As mentioned above, CIP has four main cost factors: Time, water, energy and chemicals. Time: The total time it takes to wash can be reduced by knowing exactly when the soil have been flushed from the system. Time-based methods can only approach a reasonable level of accuracy. Water: TTS-Ciptec in Europe estimates that the average CIP cycle can consume between eight and 12 cubic feet of water. A highly accurate turbidity sensor can save upwards of 20% of the water usage. Energy: Heating of the cleaning agents and water are the biggest energy consuming operations. The cost of heating chemicals is similar to the cost of water usage. By reducing the CIP cycle times, you can also reduce energy costs. Chemicals: Costs of chemicals can vary considerably. Newer, additive chemicals are more expensive, but can reduce energy and water usage. After every wash is performed, some chemical is lost and mixes into the wastewater. Turbidity sensors can help reduce the overall cost by optimizing and reducing the CIP cycle times and monitoring the flow of solvents during the various stages. The automation of the CIP process requires reliable turbidity sensors that can withstand harsh chemicals (acid and base) and frequent temperature fluctuations. To eliminate the risk of bacteriological contamination, CIP is sometimes followed by sterilization with steam via a process known as SIP (sterilization-inplace). Most semi-modern CIP processes are known as recovery systems where every attempt is made to re-use the cleaning agents as many times as possible for both cost and environmental considerations. 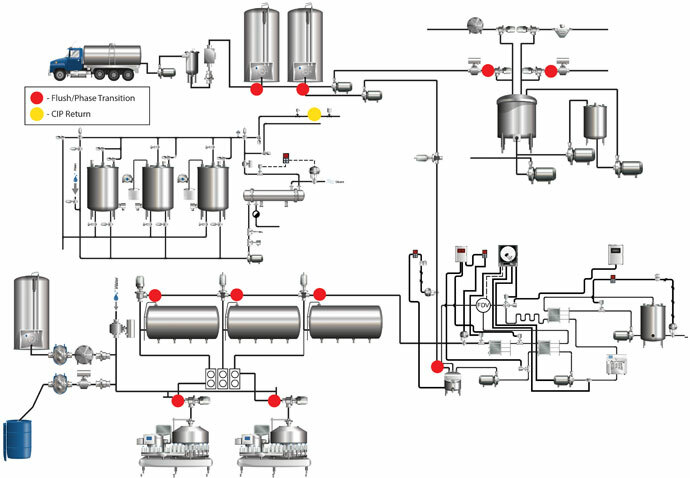 When starting up, running empty or transferring between tanks, the milk product must be differentiated from the rinse water remaining in the piping. The infrared light is directed to the center of the pipe. This eliminates any potential variances caused by temperature, changes in viscosity, or build-up on the pipe. The measurements are always accurate and repeatable. The improvement oversight, time control or volume acquisition is immediate and consistent. Aside from increased productivity, you will see higher product quality, the reduction in energy and fresh water requirements and better environmental protection. The Anderson Instrument ITM-3 provides the fastest ROI, costs 40% less than comparable products, and is the only turbidity sensor designed with 80+ years of dairy experience for rigorous demands of the dairy industry. We guarantee no other product can outperform the ITM-3 in accurate detection of phase transition for product optimization, CIP optimization and BOD mitigation. The vast majority of Dairy process control integrators insist upon the Anderson Instrument ITM-3 turbidity sensor in their designs because nothing works better, is more reliable, and is more accurate while providing the best value. 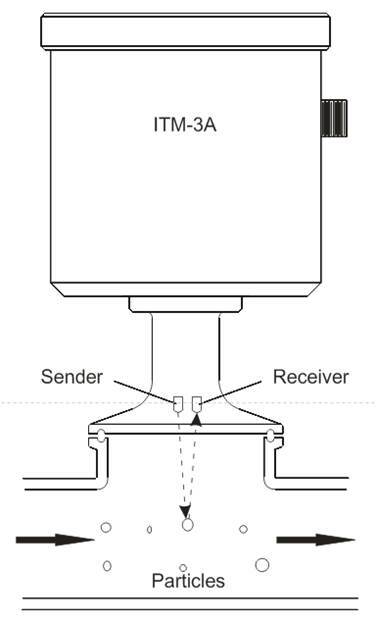 The ITM-3 is located in the CIP return line before the drain valve. During the pre-rinse step of the CIP cycle the water returning from the cleaning loop is monitored by the ITM-3. The ITM-3 produces an analog output proportional to the relative turbidity of the returning rinse water. 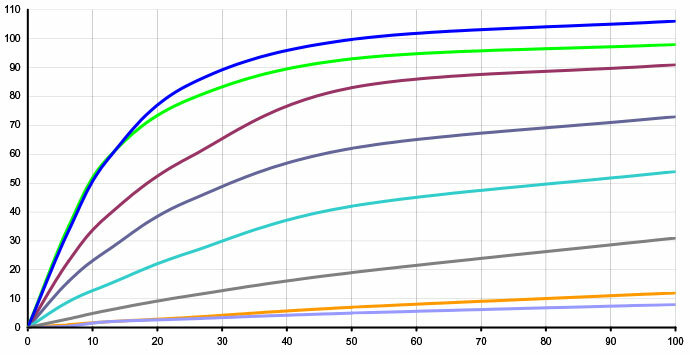 An automatic control (PLC) acts upon the input based on a setpoint that represents the optimal turbidity for the pre-rinse to be complete. Once the signal from the ITM matches the setpoint the control closes the drain valve and advances to the wash step of the cleaning cycle.